It is with great sadness we report that Jeff Wagner passed away on February 11, 2019. Family and friends have been working with Help Hope Live to raise money to help finance uninsured medical expenses associated with his catastrophic illness. In loving memory of Jeff, Help Hope Live will continue to accept charitable donations to help defray uninsured costs that were incurred. Jeff had chosen to fundraise with Help Hope Live in part because the nonprofit organization provides both tax-deductibility to the full extent allowed by law and fiscal accountability to contributors. Contributors can be sure that funds contributed will be used only to pay or reimburse medically-related expenses. To make a kind contribution to Jeff’s memorial fundraising campaign, select the “Give” button on this page or call 800.642.8399. 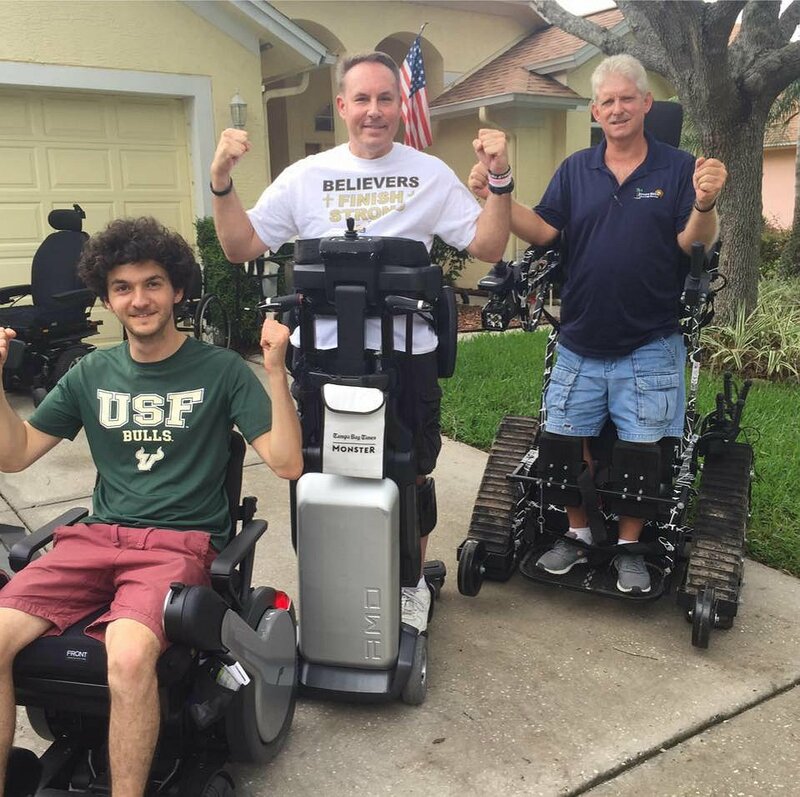 As of 8/1/17, we now have almost $ 40,000 raised, and have purchased the RMD, robotic motion device, that is like a 4 wheeled segway for someone paralyzed like me!! I have been to church, many sporting events, concerts, and more with this, becoming totally comfortable to do this on my own now!! Recently, I have purchased the Action Stander Tractor, to go anywhere off the concrete and carpet, to the beaches, parks, and so many great places! I even went to a Sunrise Easter Church Service with my Family, for the first time since being paralyzed!! 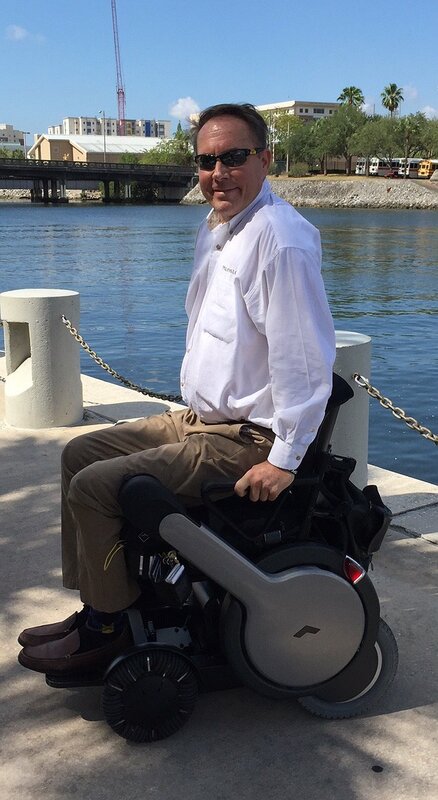 I have become the Tampa Area Ambassador, for the WHILL, a sleek, smooth riding, futuristic Power Assist Chair, that is a strong every day chair, when I need to save my hands, shoulders with wear and tear, as the years go by. There is no better feeling I have had in nearly 9+ years since becoming paralyzed, no fault of my own, from cancer treatment. For the first time, I look at people on equal scale and am off my bottom, where I was bed ridden for a year, due to a pressure sore. Now, I can get back to work outside of the home and have a active life, not having to sit and comprise my skin! Thank you for your continued generous donations and asking others you know to help with the cause! I so want to expand my territory for HIM and Give God all the Glory!! Please let me know if you have any suggestions or ideas to help me fund raise and spread the word! As of 10/18/16, my birthday, we now have almost $ 20,000 raised, to purchase the RMD, robotic motion device, that is like a 4 wheeled segway for someone paralyzed like me!! I have been to church, many sporting events, concerts, and more with this, becoming totally comfortable to do this on my own now!! There is no better feeling I have had in nearly 9 years since becoming paralyzed, no fault of my own, from cancer treatment. For the first time, I look at people on equal scale and am off my bottom, where I was bed ridden for a year, due to a pressure sore. Now, I can get back to work outside of the home and have a active life, not having to sit and comprise my skin! I truly want to have both of these devices by Christmas time!! Sports Story done on BrightHouse BayNew 9 envisioning Jeff walking again!! Jeff's memory will go on forever. He touched so many lives and life is more colorful because we've known him. Jeff went home to be with the Lord on 2/11/2019 at home in Tampa,FL. Jeff, We have enjoyed fundraising and following your story to get these medical devices. You are an inspiration to our Bible Study! Excited for you, Jeff! Praying God blesses you always. Jeff, We are all stronger in our life, faith, and families because of what we have learned from you. Your resiliency is second to none and Laura and I are blessed to have known you for so long. Go Bulls & God Bless! You're a very good and giving man Jeff. I am so happy to help you get this. I only wish I had more to give. Good Luck in Christ's Name. Love You Man! You are a trust inspiration to us all my friend! God Bless! Your will to compete has continued to serve you wel, JJW. Amazing, amazing progress! You are an absolute inspiration. You are an instrument of His Grace through this journey of yours. Peace friend! Love you Jeff! You are such an amazing person. Finish Strong my friend. Glenda T.
Hey Big Bro, Your passion for life is inspiring. Based on how many people's lives you have touched and who genuinely love you, I have no doubt you will reach your goal. God Bless you.